I have a confession to make: I’m not really a music person. This is the sort of statement that raises eyebrows of confusion among my peers. No, I don’t really need a pandora and a blip and a last.fm account. I appreciate the ambiance created by live music, but don’t really see the need to seek out full-blown concerts of either the popular of classical variety. For me, music is best when it’s being used to present or prop up something else: a story, a dance, a mood. Music is powerful, but rarely does a musician or band grab me all on its own. But there’s one band that rises above all others and gives me everything I could want in music and more, a band that produces songs with narrative, songs that make you want to get out on a scuffed wood floor and dance (and I’m talking real swing-your-partner-until-she’s-dizzy, breathless, stylized partner dancing that fell out of popularity somewhere in the 1950s, not the bump-and-grind of the modern club), song that combine acoustic and electric and old and new seamlessly. And best of all, if you know what to listen for, their lyrics are really, really nerdy. I’m talking about Flogging Molly. Best of all, even within the history-heavy Irish music genre, Flogging Molly this ability to invoke historical images and historical narrative better than any other band or musical group I have ever heard. More than the Dropkick Murphys, or The Pogues (yes, even more than The Pogues), or even more traditional-sounding bands like Great Big Sea and Gaelic Storm, they are attuned not only to the celtic folk musical tradition they are following in, but to the complicated, muddy history of Ireland itself. And let’s face it, guys. That’s my kind of nerdy. There, smack in the middle of contemporary pop song, is a short, emotional history lesson of that dreaded Irish side of the English Civil War. To fill things out a bit, here are the sordid historical details: Once Oliver Cromwell had taken control of Parliament, executed Charles I, and named himself Lord Protector, he set to conquering Ireland. After three years of some of the bloodiest fighting of the English Civil War, Cromwell’s army defeated the largely Catholic Irish insurgents, stripped Irish-Catholic nobles of their land, and sent Irish prisoners of war and their families into forced slavery in the West Indies – and thus effectively set the stage for the history of Ireland for the next three hundred years. * The song is chock full of historical vocabulary: it refers to “roundheads” (Cromwell’s political supporters in Parliament), “the Butcher” (a Cromwellian nickname), and “redlegs” (nickname for the Barbadian descendants of those Irish slaves and other poor whites). Though the song’s lyrics do not make the direct link, it is about an event that came to define the worst of Irish politics and turmoil until very recently. That’s not the only historical event to which the band directly refers, either. “Far Away Boys,” takes on the topic of the building of America’s trans-continental railroad, which famously used and abused Irish immigrant labour to create the railway that, for the first time connected the United States from East to West. Likewise, the opening verse of “To Youth” speaks of the Great Migration to America after and during the famine. “Screaming at the Wailing Wall” directly addresses the madness of religious war in the context of the Middle East conflict. There’s a mood and a tone to Flogging Molly’s lyrics and style that remind me, whether it was meant to or not, of some of the most noted Irish scholarship. The sense of loss and uncertainty in “Black Friday Rule,” is the heartfelt musicians’ answer to Kerby Miller’s seminal Emigrants and Exiles, one of the most detailed pieces of historical scholarship in existence about Irish emigration to America. “Drunken Lullabies” speaks with a cynicism and despair at Ireland’s obsession with its bloody past. “Must we starve on crumbs from long ago?” Dave King asks. Here’s a grand, sweeping statement sure to make any professional scholar of Irish culture or history cringe: Flogging Molly is the modern answer to the intimidatingly grand and deeply rooted tradition of Irish music as Roddy Doyle was to the equally intimidating tradition of Irish literature. Both are rooted in an Irish tradition that has been romanticized on both sides of the Atlantic, both speak to modern cynicism and wryness, and both inject irreverence where it is most needed. Both are well aware of the complicated water into which they wade. 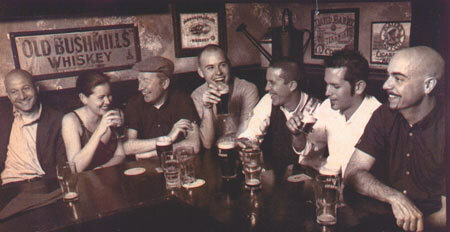 In its own pop culture-laden sort of way, Flogging Molly brings the long tradition of Irish folk music into the new millennium not by watering it down in the awful tradition of green St. Patrick’s Day beer, but by providing a new perspective, relevant to Irish history and to the world. “Must it take a life For hateful eyes to glisten once again? there’s a fan run Twitter site that’s better than the official one here!